A vee neck, because that is what I usually wear. Necklines are among the easiest things to change on a tee pattern, but I figured I might as well start with the one I use most. A close fit through the body with waist shaping. A good close fit under the arms — droopy armholes destroy fit, imo. Both cap sleeves and long sleeves. Enough room in the bust to accommodate my girls. Please excuse the headless selfie. I’d just taken a post-workout shower and didn’t feel like bothering with makeup and blowouts. Lazy! The fit through the shoulders is excellent. The torso shaping is smooth and close without being tight. The neckline hits exactly where I want it. The sleeves are perfect in both angle and volume. I might add just a nudge more room in the bust next time, maybe a half-inch, but other than that, this is a perfect fit. The fabric is a mediocre rayon from JoAnn, but now that I have my block where I want it, can use this to draft patterns and use some of the better knits in my stash. I have a printed ponte knit that will make a great little t-shirt dress for fall, and I’m already scheming to get that cut and sewn in September. I found this process really useful. I’m sewing for a brand-new body now, and I’m rediscovering things that used to be so familiar, like the way a narrow ribcage can change the fit at the shoulders. This sort of thing used to be second nature, but it’s been a long time now since I’ve sewn in this current size. For the record, that size is a hybrid of extra-small and medium on the Kwik Sew pattern sheet, before alterations. 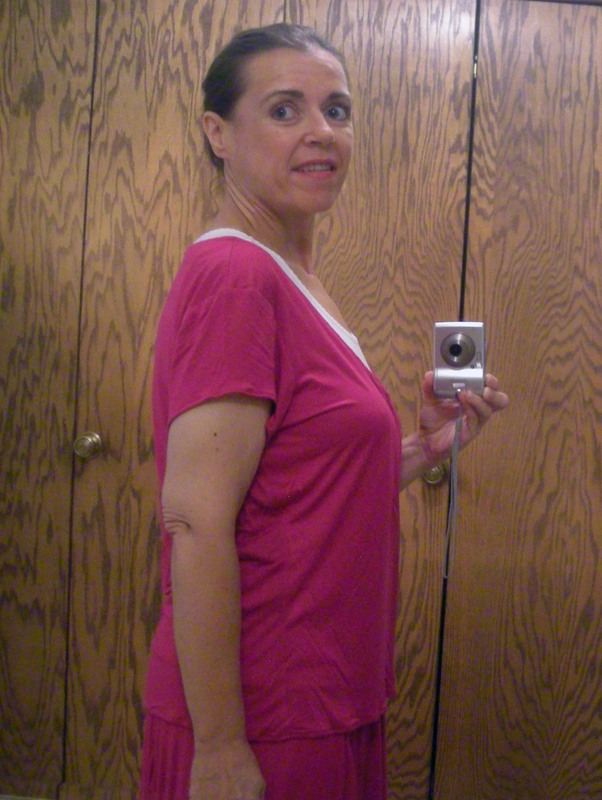 After I lose the last few pounds — just 11 to go now! — I’m sure I’ll need to do more adjusting to the block. But for now, it’s perfect, and the process of perfecting it has prepared me for the work I’ll need to do in future patterns. Thank you, Sewing Pattern Review, for sponsoring this challenge! It was a pleasure! Have you ever participated in a sewing or knitting contest? If so, what did you make? A couple of days before Sewing Pattern Review announced its TNT Tee Challenge, I had already pulled out this Kwik Sew 4027 pattern with the intention of using it to create a new block. I chose this pattern for exactly one reason: the v-neck. It’s a deep vee, but I knew it would be easy enough to move that line up and still preserve the basic shape. I prefer a vee to a crew, no contest. I figured that once I got the rise where I wanted it, it would be easy to modify this to make it scoop, square, or any other shape that shows off a bit of collarbone. 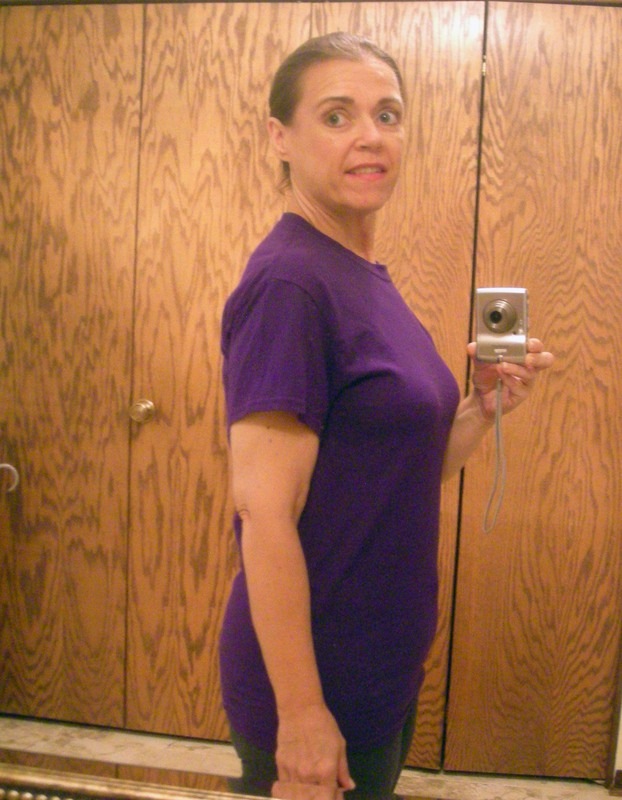 And I wanted to create my own tee block because, frankly, no ready-to-wear shirts ever fit me correctly. It’s always the same problem. 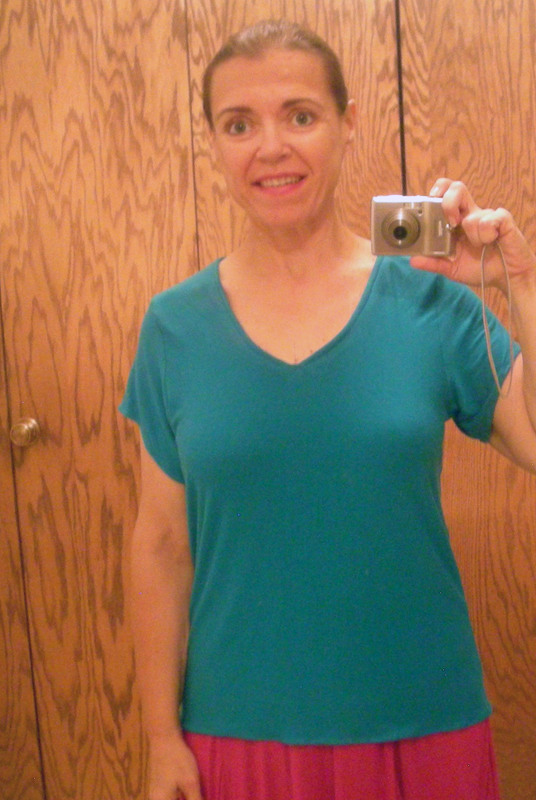 Here’s a sample — this is me in a standard Gildan tee, size small, purchased from Michael’s. 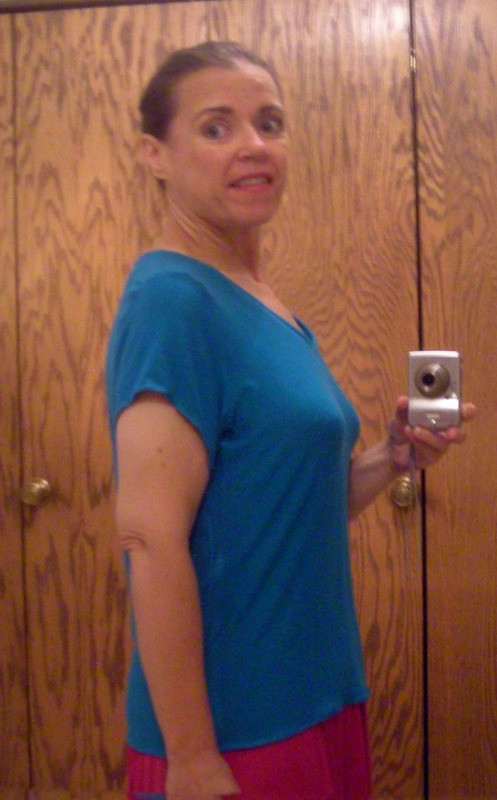 Notice the wrinkle lines running from the lower armscye to the bust point, and from the bust point down to the waist. Those of you familiar with the acronym FBA will know exactly the cause of this fitting problem. You might also notice that the shoulder seam is a bit dropped. 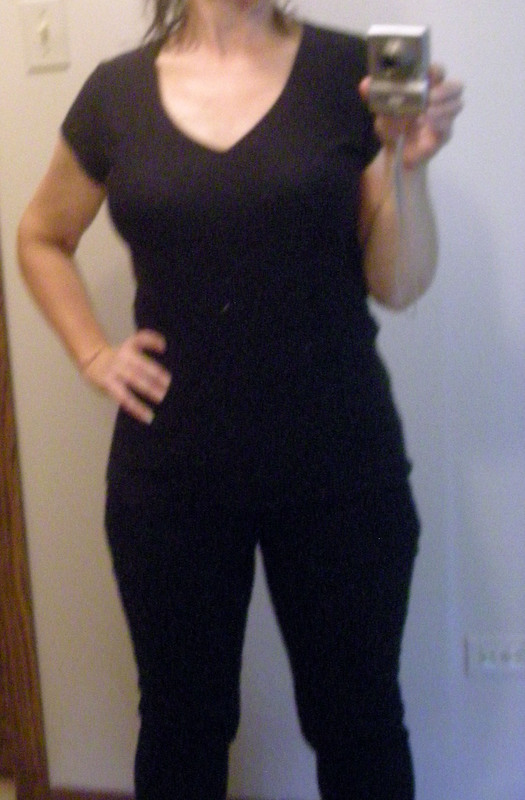 Narrow shoulders + large breasts = fitting woes. I don’t mind a slightly dropped shoulder on something as casual as a tee, as long as the rest of the fit through the body is good. With that in mind, I used some leftover fabric from this maxiskirt to cut my first version of this tee. (Fabric source: Mood Fabrics.) This one was meant to be a muslin, and though I did alter the pattern to increase the bust, I didn’t expect a perfect fit this first time through. Good thing I had such low expectations. That fit is atrocious. The less said, the better. I had started with the size medium and added nearly an inch to the bust at the side seam, but this is clearly a bad fit. So, for my next attempt, I used this same body pattern piece and used the pivot method to increase the bust by about two inches — nearly an inch from the original side seam adjustment, plus an inch from the pivot. I cut this version with long sleeves using some white cotton and lycra from the stash. (I don’t remember the source — maybe the Textile Discount Outlet on 21st Street?) This fabric turned out to be a little too stiff to complement the pattern, which works better with a drapey knit. But I’m really glad I made it, just the same — this will be a good pajama tee, and the fit problems with this one really helped me solve this pattern. You can’t see it in this picture, but there is a shocking amount of extra fabric under the arms. And yet, the tee still manages to pull at the bust. The shoulder seam drops a good way down the upper arm, too. At this point, I decided the shoulders needed some work, or this thing would simply never fit. So for my next version, I went back to the original pattern. I measure the cross-back carefully to get a neater fit at the shoulder, and chose to cut it extra-small through the shoulder and medium through the body. Experienced seamstresses are right now zooming in on what that means, and they are shuddering with horror. Yes, I did that thing you are never supposed to do. I redrew the armsyce. And yes, I was quaking in my house slippers the entire time. After I redrew the armscye to grade it from an extra-small shoulder to a medium bust, I measured front and back to determine the length of the new seam. And then I measured the sleeve heads on the pattern to find the one closest to the new armscye measurement. That turned out to be the medium sleeve, minus an eighth of an inch at either end. I also used the pivot method to add about 3/4″ to the bust front. 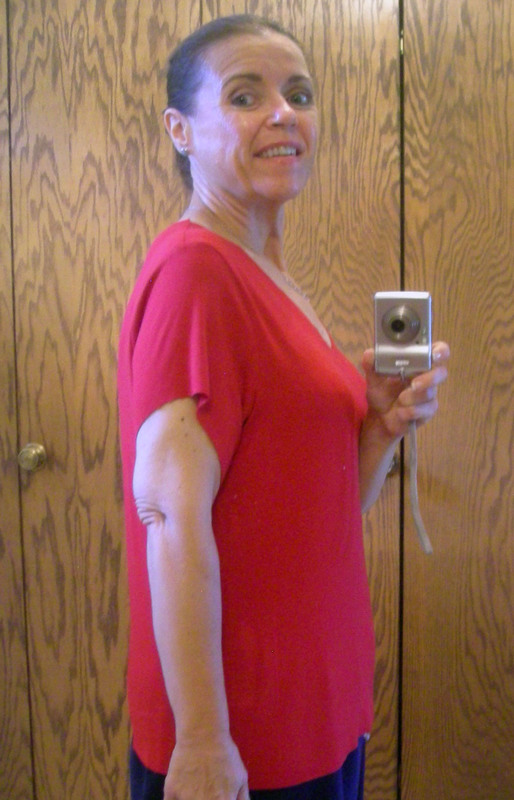 Here is tee the third, made in an inexpensive rayon jersey from JoAnn purchased just for this experiment. When I tried on this version, I knew I was getting closer. Not all the way home, but closer. I would be willing to wear this one in public, which is more than can be said for the magenta (destined for the trash) or white (destined for pajama status) versions. I’m still not happy with the bust, and the drape on the sleeves could use some tinkering. Actually, the problem with that drape results from my tinkering in the first place. 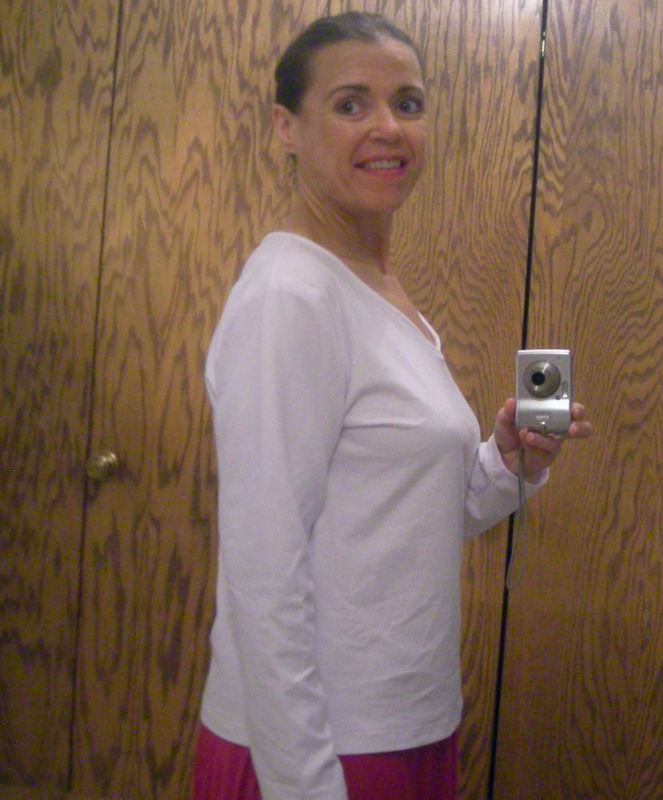 I wanted the sleeves about an inch longer, but still with the slant to the hem — you can see that the sleeve hem is not horizontal, but at sort of a 45 degree angle from the body up and out. I like that. I just wanted it longer, so I extended the sleeve, rather badly, as it turns out, but not so badly that it can’t be fixed. I ended up redrawing the sleeve pattern piece to sort this out, an easy fix. Look, ma, no underboob wrinkles! This still isn’t perfect, but it is finally fitting through the bust and shoulders. In my next version, I’m going to remove some of the extra fabric from the sleeve — see that fold on top of the bicep? That will be gone. And I will remove some of the extra fabric at the waist and hip, something I hesitated to do until the fit at the bust and shoulders was smoother. I don’t want to add waistline darts, but some of that fabric has got to come out. The current cut through the body is adding an easy ten pounds to my torso, and I’ve fought too hard to get the pounds off to let a tee shirt put them back on. But we’re getting closer. We’re definitely getting closer. I won’t have any sewing time again until Friday, and at that point, I plan to go back to my friendly neighborhood J-store for more inexpensive rayon in yet another color, and given how expert I’m becoming in assembling this particular pattern, I could easily have the next version done by Friday night. 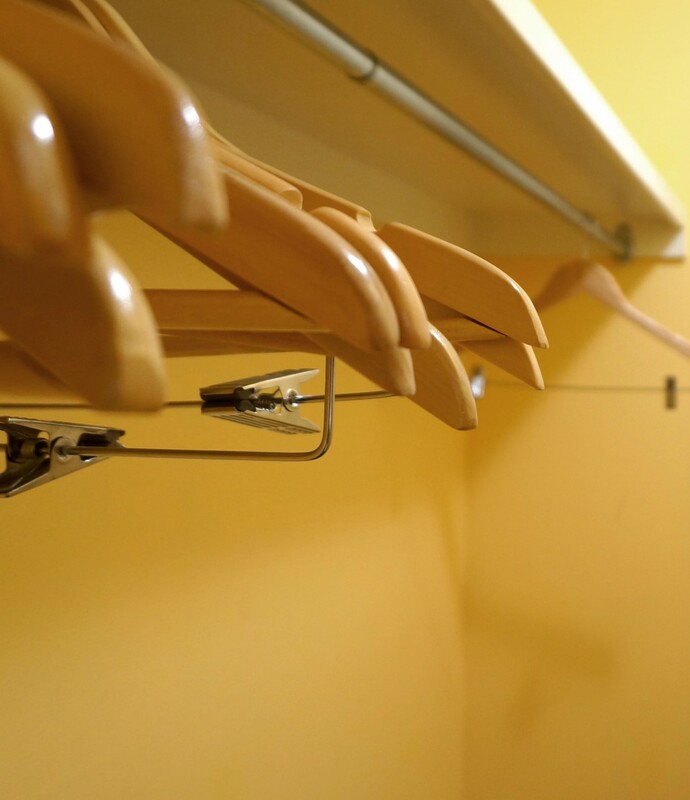 We all have our fitting woes, but this is one I intend to solve. Once this block is perfected, I will be able to use it as a base for any somewhat drapey knit top. Okay, so I pulled the trigger and entered my first Sewing Pattern Review contest. 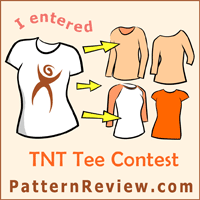 For this contest, we are meant to make between four and six t-shirts built from the same pattern. It’s okay to vary the pattern. I had already planned to use this Kwik Sew pattern to create a basic tee block for myself. So this contest gives me the perfect excuse to do that. I like the deep vee on this one, which looks great layered over a tank. That will be my first iteration of this pattern — basically, just a clone of the white tee in the picture. I can raise the neckline for a second tee, and I can add a stretch lace inset for a third. The fourth, fifth, and sixth? Hmm. Must ponder! I don’t have much spare jersey (okay, I don’t have any spare jersey, really) in my stash, so this will require some fabric shopping. But I can’t wait to get started! If you were making this pattern, what modifications would you make?